In my Toronto wedding photographer career I documented a lot of weddings at King Edward Hotel and then of the building inside out. Instead of relying on the old shots that everybody does I always try to create something you every time I shoot at King Edward. In this case, I wanted to create a bridal portrait that signifies the beauty and the importance of the bride. As such, I asked the bride to stand next to the Queen's painting and took a couple of frames. First I illuminated the bride using a video light and shot different expressions of her until I was happy with the outcome. Next, I photographed a few pictures while illuminating only the Queen. There is a concept called shoot to edit meaning that one should photograph while having the final picture in mind after doing all the editing. In this case, I combined the two frames in postproduction to create this stunning portrait. The colour palette in this photograph consists of tones of blue and gold. It is one of the most pleasing combinations of complementary colours for the human eye. The brides bouquet made of red roses provide a gorgeous accent in this photograph. What makes this image special, is the brides pose, similar to that of the Queen. Even more, the lighting emphasizes both ladies in this image. 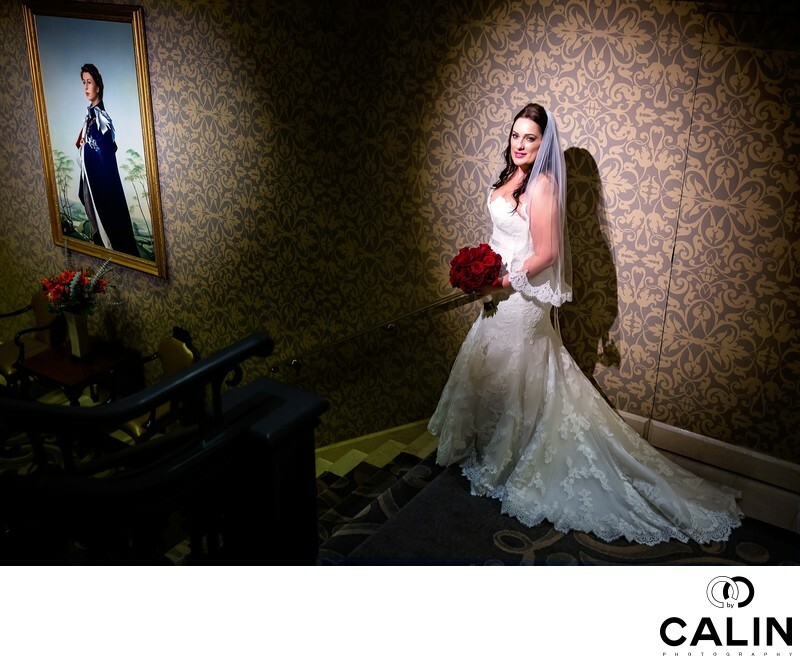 From composition standpoint it is a balanced photograph that gives a slight visual advantage to the bride to highlight her importance.